The 7 species of Alaskan grouse and ptarmigan occupy and utilize a wide variety of habitat types throughout the state. Ptarmigan (rock, willow, and white-tailed) tend to utilize alpine habitats that have a very slow successional period and are rarely altered by fire or other types of natural disturbance. However, grouse occupy a variety of lower elevation habitats that historically have relied on natural disturbance (ie. fire) to create a mosaic of seral stages across Interior and Southcentral Alaska. Spruce and sooty grouse rely on mature mixed conifer / hardwood stands. Ruffed and sharp-tailed grouse, however, rely heavily on early seral stage forests for breeding, nesting, and brood rearing habitat. 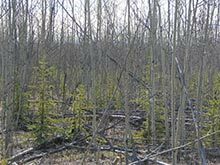 In Alaska, quaking aspen, willow, and dwarf birch often are the first species to regenerate after fire. 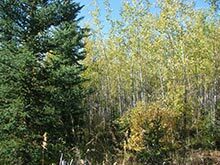 These tree species offer high quality forage as well as cover for ruffed and sharp-tailed grouse. As a result of the fire prone landscape found in Interior Alaska, these two species have flourished in young forests, 1-20 years following fire. 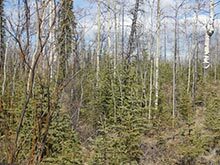 Other game species like moose and snowshoe hare also benefit from young forest stands and the dense regeneration of certain hardwood species that grow in immediately following natural disturbances. However, it's not just popular game species that benefit in Alaska. There are certain species of songbirds and small mammals that also benefit from these young forests. The ADF&G has been engaged in grouse habitat modifications projects throughout the state since the early 1990s. During this time ADF&G has worked very closely with groups like the Ruffed Grouse Society, local landowners, and sportsmen and women. 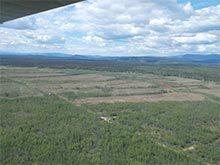 The majority of these projects have been aimed at benefiting ruffed and sharp-tailed grouse and moose. 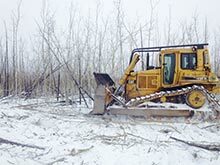 Habitat modification projects have taken place near Fairbanks, Delta Junction, Palmer, and are ongoing in Tok. The Small Game Program remains actively involved in continuing these projects and in providing access to them for interested small game enthusiasts. Legal Disclaimer: These maps are designed only for references and should not be used for delineating private versus public land.